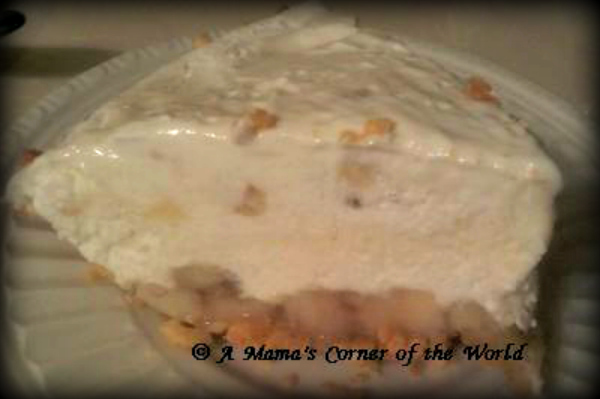 Looking for a quick, low fat alternative to Banana Cream Pie? We have substituted multi-grain Peanut Butter Cheerios for high fat pie crust—and use the sweet, creaminess of light banana cream pie yogurt for the filling. Not only is this a yummy dessert—but, it is our second Blogging from A to Z challenge entry: B is for Banana. It is also a Swapportunity with Yoplait Light Yogurt! Prepare the Crust. Preheat oven to 350 F. In a 9 inch pie plate, combine the crushed cheerios and the butter or margarine with a fork until well combined. Press into the bottom and up the sides of the pie plate. Bake for 10-12 minutes. Add bananas to the crust. Press banana slices onto the cooled pie crust and set aside. Prepare banana cream filling. Combine yogurt, whipped topping and banana pieces in a medium mixing bowl. Pour into pie crust. Freeze and serve. Cover pie with plastic wrap and freeze for 3-4 hours. Allow to sit at room temperature for 20-30 minutes, slice and serve. You may opt to top with vanilla wafers, whipped topping or additional banana slices if desired. Disclosure: I was a member of the Yoplait Light Swap Team in 2012. I occasionally received yogurt samples and gift cards to create recipes and healthy food swaps with Yoplait Light. As always—all recipes are my own and all of my opinions my own as well. Hmmmm, this actually sounds pretty yummy! Oh I am so glad I found you on the A-Z Challenge! I will surely make these yummies. Thank you!